Shower Chair, Shower Chair with Arms, Shower Chair with Cutout Seat, Plastic Shower Chair, Durable Shower Chair, Safe Shower Chair, Eagle Health Supplies, 62321. 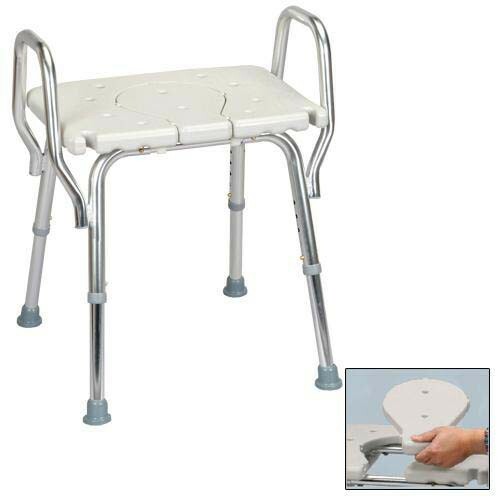 Shower Chair with Arms and Replaceable Cutout Seat, manufactured by Eagle Health Supplies, is a durable and safe shower chair. You may select this chair if you need to increase your safety in the shower or tub. Featuring a blow-molded plastic seat and back with a textured finish, this shower chair will provide the user with unparalleled comfort and support. Additionally, this seat has a replaceable cutout that you can effortlessly remove to gain access to your perineal area. With this feature, washing those hard to reach areas becomes incredibly easy. The shower chair also features a rustproof and durable aluminum frame. The Shower Chair with Arms and Replaceable Cutout Seat, additionally, comes with rubber tips to help prevent the chair from sliding in the shower or tub when there is moisture. Including arms, sitting down and standing up becomes more safe and easy, too. With this shower chair, you will find the freedom to shower independently and with confidence. Blow-molded plastic seat with textured finish. Cutout to allow you to reach those difficult areas. Seat Size: 19 x 14.5 inches. Seat Height: 16 to 20 inches. Base Width: 18.5 to 19.25 inches. Base Depth: 18 to 20 inches. Armrest Height from Floor: 21.5 to 25.5 inches. Seat to Top of Arm: 5.5 inches. Distance Between Armrests: 18.75 inches. Application: To assist with stability in the shower. chair is very sturdy and well made. I like it better than the common white ones with a back. 1. the gray rubber footings at the bottom of the chair legs are wider and sturdier. 2. the holes in the chair are larger and easier to clean. 3. the side handles make the chair easier to grasp and move, or for my mom to raise herself up. 4. the removable seat is ideal for cleaning her bottom, while she is seated. 5. my mom never leans back, so not having a back to the chair makes cleaning her back much easier. 6. the chair was very easy to assemble. There are two things that are odd about the chair. There are two notches in the front corners and I don't know what they are for. Also, the best chair height left an open hole at the top of each leg and if water were to drip inside, I don't see a way for the water to drain out of the leg. So, I put a tape over each hole, to prevent water from entering the inside of the chair leg.